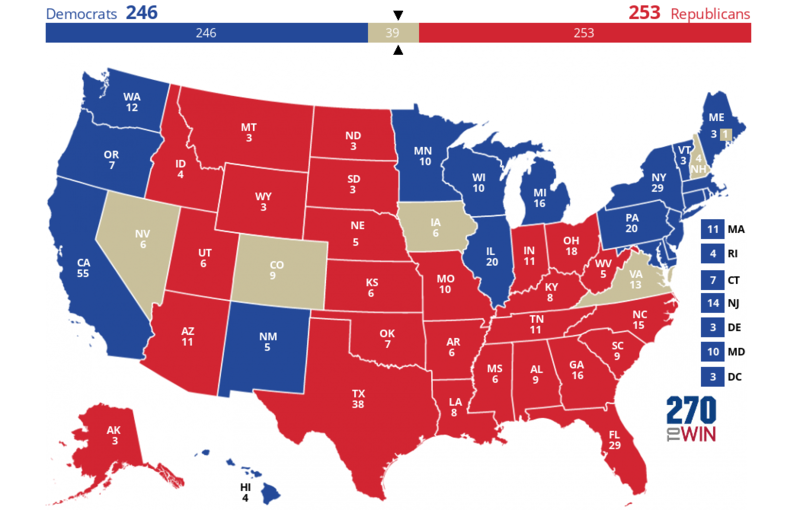 To win the White House first Donald Trump must win all the states that Mitt Romney won in 2012. 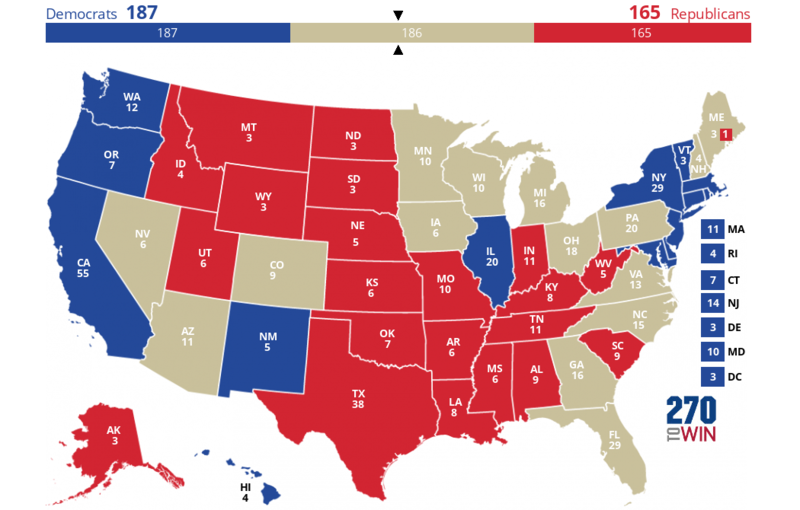 The map below shows the states that Romney won. Donald Trump must then win Ohio and Florida. Wisconsin, Michigan, and Pennsylvania although very much in play this election, they have a record of voting for the Democrat Presidential candidate and have not voted for a Republican in decades. Recent polling does show Donald Trump only down by a few percent in those three states. The latest polls from Nevada, Colorado and Iowa all show Donald Trump is ahead of Hillary Clinton. 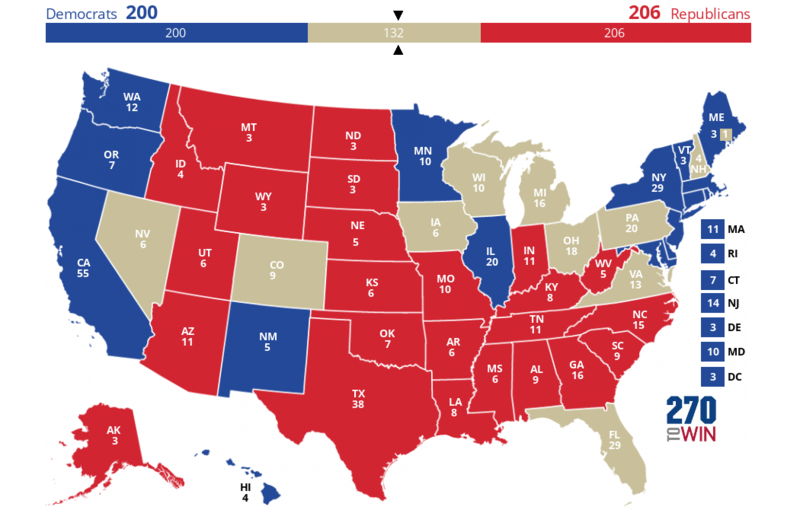 Trump taking those three states will put Donald Trump at 275 which is 5 above 270 the minimum required of electoral votes to win the Presidency. We also give Trump one electoral vote from maine because the latest polls show Trump winning in Maine's 2nd Congressional district which gives allocates one electoral vote to the winner of the popular vote in the 2md Congressional district. The outcomes in the two remaining states of New Hampshire and Virginia would not matter if my prediction above is correct. As it stands right now Hillary is ahead of Donald Trump in New Hampshire and in Virginia so we put both of those states in her column. Donald Trump put his campaign on pause today as he joins others in New York to remember those who lost their lives on the 15th anniversary of 9/11. ​Matt Lauer and 2016 Republican Presidential nominee Donald Trump discuss his plans for dealing with ISIS, the VA and other military issues. This post is a highlight of the recent attacks that went back and forth on twitter between Donald Trump and Hillary Clinton. "Obama just endorsed Crooked Hillary. He wants four more years of Obama—but nobody else does!" The liberal media and some on the internet flipped out over Hillary's tweet. They were saying how Hillary owned Donald Trump and that she put Donald Trump in his place. "How long did it take your staff of 823 people to think that up--and where are your 33,000 emails that you deleted?" With that tweet from Donald Trump it effectively stopped Hillary Clinton. Remember you can't stump Donald Trump. "If anyone knows how to use a delete key, it's you."